Hey guys, so I came across this quote this morning and it really stood out for me. 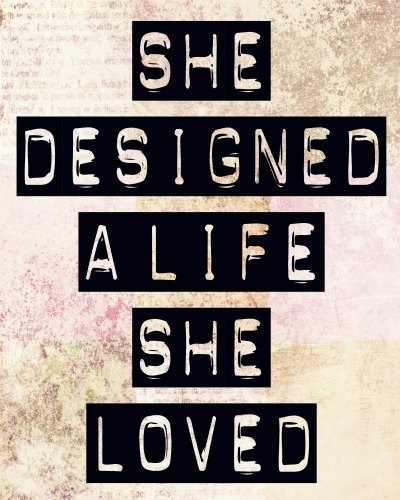 We only get a certain amount of time in life and then we are gone, so why not design the life you want to live. I know you might be thinking ” Well, what am I supposed to do about money? I need to work a job I don’t love to get by.” Yes, that is the main reason why a lot of people can’t follow their dreams. If there is something that you want to do with your life that sounds like a crazy pipe dream to most, think about this; what will your life be without it? Most people are fine with sacrificing their dreams because they are extremely difficult to achieve and they don’t want to give up the security they have in their life by pursuing a dream that may never happen, but if it’s all that you want to do in life, it might be a good idea to try it. I’m not saying to go out and quit your jobs but at least try to do something that gets you closer to your dream like take up a dance/acting/signing/guitar class, begin the first chapter of your novel or start a night class. I know it sounds cliche but you do only live once (YOLO :P) so we should be trying to live a life we love and enjoy, not one that we dread waking up in the morning for, and I guess that’s everyone’s goal in life, right? to be happy? So why not find something that makes you happy and do it, even if you can only do it for one hour a week, or even a month. If it’s what truly make you the happiest, then why not? I hope you liked this post. If you did, like it on Bloglovin or give it a +1 on Google plus. It would mean a lot. Leave a comment down below about what you really want to do in life or even just say if you have absolutely no idea what you would love to do. I love reading all your comments.